I love Albert Einstein’s quote ‘everybody is a genius. But if you judge a fish by its ability to climb a tree, it will live its whole life believing that it is stupid’. We are all geniuses, all infinitely intelligent beings if only we knew it. It is only when we start to embrace this powerful energy that lies within us that we step into our personal purpose. We lose a lot of the fear holding us back. We stop being a fish trying to climb a tree instead we acknowledge who we are and what we want in life. Quite often we do what other people want us to do and not what our own intuition is guiding us to. For example, becoming a solicitor to please ones parents while all the time wanting to be an artist. Or staying in a relationship longer then we should for the sake of others. When we stand firmly in who we really are after a little while, and with some practice, something else begins to appear on the horizon. Source Energy is forever expanding. When we nurture the faint ripples of this energy within us and stand powerfully in our personal power and purpose the ripples reach out further. You know your connection is there and you are listening to your intuition. The Mysticism of Co-creation opens within you. You are a co-creator with Source Energy. This energy begins to gain momentum and it strongly and abundantly ripples out into our lives and the lives of all those around us. It brings with it health, wealth, joy and happiness. As you begin to fulfil your personal purpose, your higher purpose starts to unfold and you move naturally into the broader social dimension. You allow Source Energy to use your talents and gifts to express itself in you, for you and through you. If you let this energy continue to ripple unrestricted, it will join forces with a collective conscious awareness. At this point huge shifts in awareness are possible and available to you. This shift will ripple out for generations beyond you in many ways that you could never imagine. The effects are limitless. 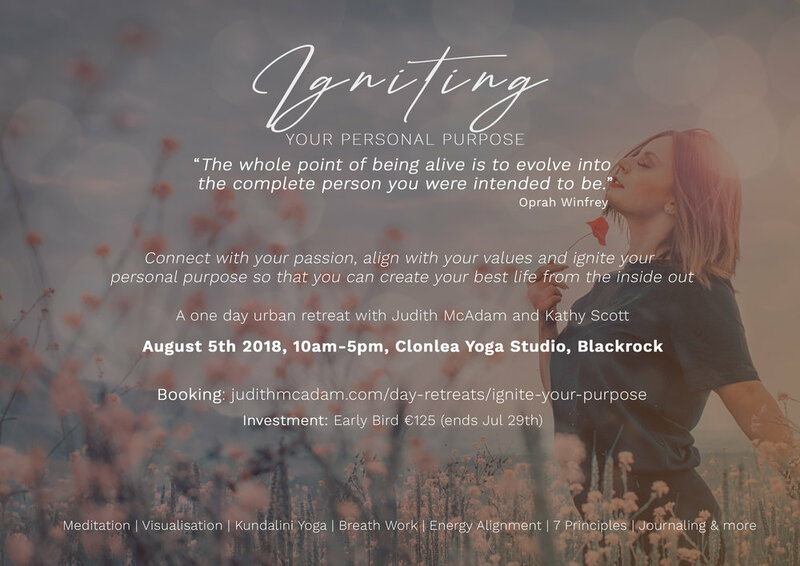 Igniting Your Personal Purpose with myself & Kathy Scott on August 5th.